In Minneapolis, Minn., there are a series of interconnected bike paths that come together to make a freeway just for pedestrians, especially those that prefer to commute without a car. This highway was developed, in part, thanks to the Non-motorized Transportation Pilot Program, for which Minneapolis was chosen in 2008; through the program, the city was given $25 million to build a network of non-motorized transportation infrastructure facilities. This included bicycle lanes and pedestrian and bicycle trails. Minneapolis also utilizes old and previously untraveled railroad tracks for this freeway, and that helps keep bicyclists off the streets and away from aggressive drivers and hard-to-follow traffic laws. While this freeway has been a great service to Minneapolis, not every city has the infrastructure or the funds to develop such a system, let alone provide itself with a seemingly simple-to-build pedestrian bridge via old railroad tracks. Instead it can take a resident years, even decades, of lobbying for a pedestrian bridge before it becomes a reality. Starting in 1987, Falls Church, Va., resident Craig Day began to show up to every local government meeting he could while encouraging his neighbors and other community members to do the same. At the time, he said, the city was planning a new streetscape project that included widening Broad Street significantly — one of the busiest streets in the small city. So, he thought it would be a good idea to have them build a bridge over the road in order to provide safe passage for pedestrians because the road would become more difficult to cross. Day was in his 30s then, but he recalled that when he was in high school, a young girl was struck by a vehicle trying to cross a long intersection after a red light turned green with her still in the middle of the road. That prompted the local government to build a pedestrian bridge, and fast-forward to 1987, he didn’t want it to take another catastrophic event before another bridge was built. But government officials were worried complicating their streetscape plans, which had been in development for a few years, could further delay the project. “I became kind of persona non grata because if I added a bridge to a streetscape program, it might knock down the whole house of cards,” Day said. Further complicating matters was the fact that the Virginia Department of Transportation, the city of Falls Church and the Northern Virginia Regional Park Authority would all need to cooperate because each had jurisdiction over a part of the property that would be impacted by the project, but that did not stop Day from trying. “This bridge came about only because many concerned citizens rallied to demand/ encourage/petition their local government to get this needed good idea built before a death occurred,” Day wrote in a comment on an article from the Falls Church News-Press website — a comment that has been edited for brevity. 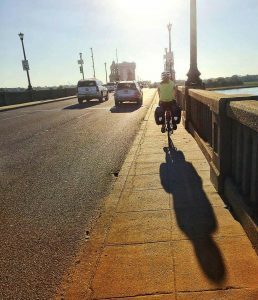 While five years may seem like a long time to develop a pedestrian bridge, it can take much longer. 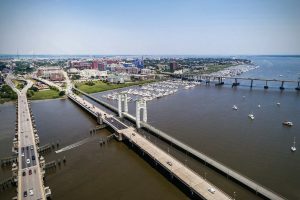 According to Katie Zimmerman, the executive director of the pedestrian safety advocacy group Charleston Moves, residents have wanted a pedestrian bridge over the Ashley River in Charleston, S.C., for decades. “From what we’ve gathered, this issue has been a debate since at least the 1920s in Charleston,” Zimmerman said. But unlike in Falls Church, no pedestrian bridge has been built, even after several pedestrians have been killed in Charleston County. She said that many of the accidents happen because the Ashley River Bridge for motorized vehicles is too narrow to allow for safe pedestrian passage. Yet this bridge connects residents of the densely populated neighborhood of West Ashley to downtown, and many residents prefer to walk or bike because they cannot afford a car or want to protect the environment. 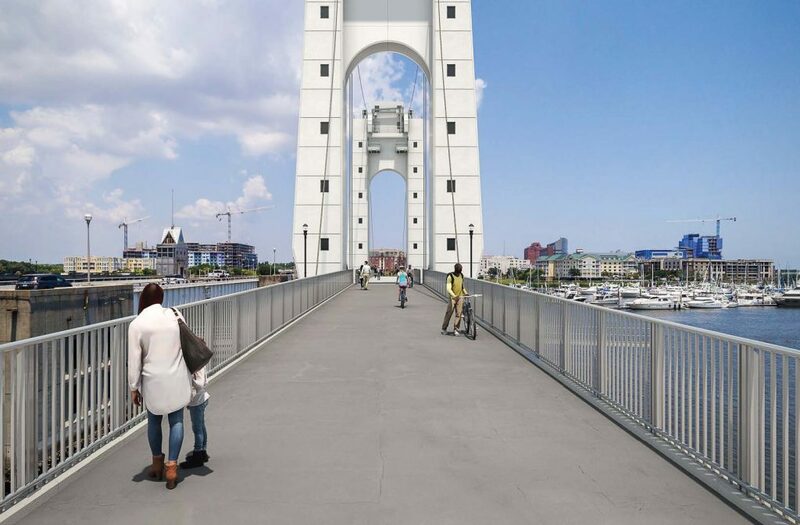 While there is a plan for the bridge, it appears to be largely dependent on the city of Charleston receiving a $12.2 million from a Better Utilizing Investments to Leverage Development Transportation Discretionary Grants — previously known as a Transportation Investment Generating Economic Recovery grant — through the federal government, which would fund the majority of the project. The city’s application was initially denied in March of this year. It then reapplied for the grant. “According to consultants who track these types of grants from the (federal government), apparently projects are usually awarded around the second or the third time that they apply,” Zimmerman said. She added there is no limit to the number of times a city applies for the grant, but she is concerned that the city might not submit the application for a third time if it fails to receive funding again. If for whatever reason the city of Charleston is unable to receive the grant, Zimmerman hopes the county will fund the rest of the project.